that's odd. I get 'This address is restricted ... Firefox has cancelled the request ..." when I tried to access an ssh server via the ftp method you showed. Hmmm, the ftp link should have given a "The connection has timed out" message after a minute or two. 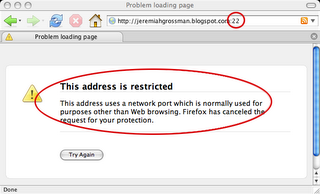 Just to follow up, when testing on firefox on a debian fox I got the "Firefox has cencelled this request" message. When I tested on firefox on WinXP I did get the "connection has timed out"
Hate to be a nick picker, but I doubt it was RSnake who found this first. He was most likely the person you know who found this first. 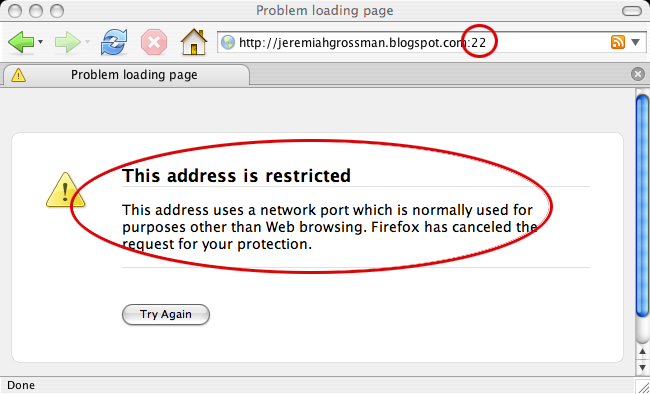 I bet the first person was the person who implemented this predicted behavior into firefox. awesome, firefox has been upgraded because of it. Congrats.